This handsome boy has quite a story, wish he could tell us all that he has seen and experienced. For now, we'll just love on him and tell him how special he is and how deserving of a great home he is. Do you have that home? Will you keep your future cat if things in your life change? If kids are born? If you move? If you get a new job? We're looking for long-haulers... people who treat their cat like family (lol, the family you actually LIKE). Neutered FIV/FeLV Negative Dewormed Microchipped Vaccinated $50 adoption fee Please enrich his indoor life with tall cat trees, scratching posts, hidey-holes, window seats, interactive play time with his humans, toys and nutritious food. 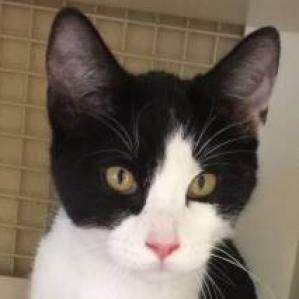 If you're interested in adopting this little guy, please click below to fill out our adoption questionnaire.